Note: This blog post transferred from my OLD BLOG and was originally posted in 2007.
as you can see the value of Y is not the desired value , this is because the illegal operation on 2 different primitive types . what just happened is known as Silent Overflow , this kind of silent overflow handled in each programming language in a different way , language like C# consider this kind of overflow is not an error that’s why it allow it by default . other language like VB always consider this kind of overflow as an error and throw exception . What’s matter here is the desired behavior the program need , in most scenarios you will need this kind of silent overflow not to happen in your code or you will get strange unexpected behaviors . add adds two values together, with no overflow checking. 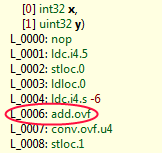 add.ovf adds two values together.However,it throws System.OverflowException if an overflow occurs. sub subtraction with no overflow checking. sub.ovf subtract two values , throw System.OverflowException if an overflow occurs. mul multiplication with no overflow checking. mul.ovf multiply two values , throw System.OverflowException if an overflow occurs. conv convert value with no overflow checking. conv.ovf convert value , throw System.OverflowException if an overflow occurs. as you can see the C# compiler generated IL uses the add instruction as it the default behavior for C# to generate silent overflow , generally you can turn that off by compile your code using the /checked+ compiler switch , which tell the C# compiler to uses the safe version of the add with overflow check , add.ovf which will prevent this kind of silent overflow and throw OverflowException if overflow occur. Sometimes you don’t want to turn the overflow globally for the whole application , rather you want to enable it only in some places in your code that’s when checked and unchecked C# operators come into the picture . Simply checked operator tells the C# compiler to use the safe IL instruction for this operation , and the unchecked use the normal IL instructions (which is the normal behavior in C#). using the checked operator in our example generates OverflowException because the C# Compiler generated the IL using the safe add instruction add.ovf as you can see . C# also offers checked and unchecked statements for wider scope of overflow checking but still determined by the developer inside his/her code . same result as you can see , OverflowException has been thrown and the generate IL uses add.ovf , just the IL get larger because the C# compiler generated more (no operation instruction nop) which you can get ride of by generating more optimized version of your app.